Cordless LED handlamp made in polycarbonate and virtually unbreakable. It has high and low settings i.e 450 and 1,000 lux at 0.5 metre. Fully charged it has up to six hours of use. It comes with a separate AC charger and initially the battery should be charged overnight (16 hours). A very handy and useful compact LED handlamp. Ideally suited for DIY and light industrial use. Magnetic base for ease of attachment with a retractable hook for non metallic situations. 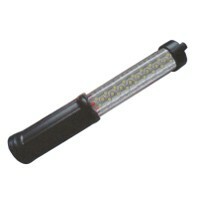 A 12 volt rechargeable handlamp with 30 LEDs giving a bright white light which draws only 400mA. It has a 3 way switch, forwards illuminates the centre strip of LEDs, backwards all 30 LEDs and centre is off. Once the lamp has discharged the red LED remains lit to assist finding it's location. A heavy duty compact handlamp with 15 high intensity LEDs, it is mains rechargeable and has a charging indicator: on/off switch, a high impact polycarbonate lens and a belt clip. A 180° folding 21 LED handlamp with 15 a 5 LED spot light. It has 2 magnets set in the back which provide a vertical fixing and 1 magnet in the base which gives a firm hold, allowing 180° movement. There are 2 hanging hooks which offer more light angle possibilities. One switch controls both handlamp and spot light, incorporated is a low battery indicator. Charging is by 230v mains adaptor or in car by 12v cigarette lighter plug.